I’d like to offer heartfelt thanks to all attendees and the #ABM Consortium partners. What a great session today! 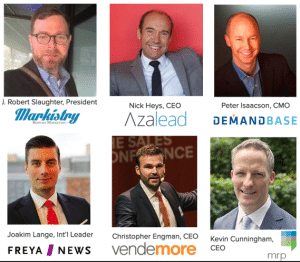 The Account Based Marketing Consortium is now the largest and fastest growing meeting place for B2B marketers navigating the waters towards ABM success. Over the last four months, nearly 2,500 marketers have engaged with us. Why? From what people tell me, it’s because of our relentless focus on the pursuit of “High-Performance ABM”. The ABM vendors in the consortium is focused on this message of performance, investing in primary research to validate our point of view, and delivering the goods with great content. One other point that struck me this week… the scale of experience and impact this group of partners has on the market. Today, our attendees heard from “C” level leaders from around the globe. We saw case studies from APAC, others from EMEA, and sure, a lot from North America. These case studies and the partners delivering them represent years of experience and the scale of clients that are literally unparalleled. While an early view, my initial perspective into market sizing for ABM platforms, this group outsizes the combined total of all other platforms in terms of revenue, number of clients and number of enterprise clients. Wow! If you missed this webinar, subscribe to this blog and we’ll share details and make sure you see the invite for our next webinar… just a few months away! Hey, and don’t forget to participate in our LinkedIn Group. Love to hear from you!